The Matha Amrithanandamayi Ashram is home to the Hugging Mother, a living spiritual figure, famous for hugging and consoling her devotees. Having previously watched a Louis Theroux episode when he visited several religious places in India, we recalled the part when he had seen Amma, or ‘Mother’. 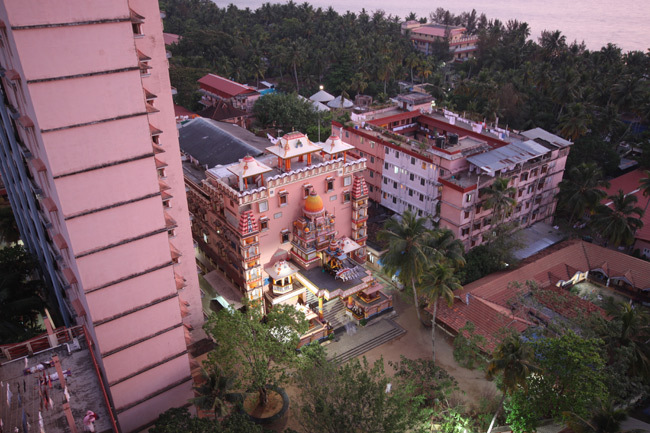 Being in the neighbourhood in Kerala, on the south west tip of India – we simply couldn’t pass up a visit to the ashram, where you can stay, meditate and get a chance of hugging Amma herself. 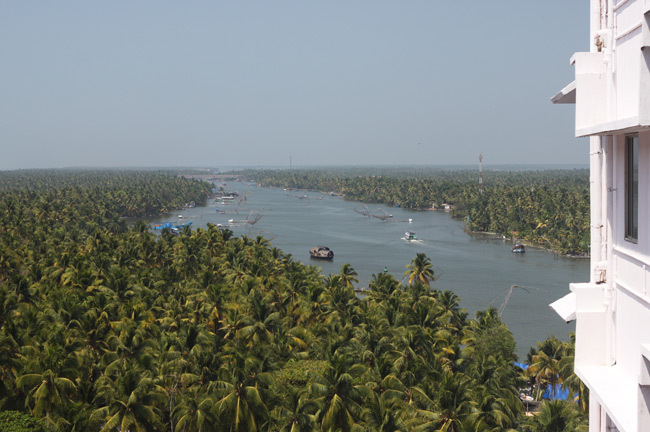 During our time in Varkala and on our backwaters ferry journey, we’d heard a lot of stories about the ashram, the people, and what goes on there. As Louis expected, we too expected brain washed followers of a normal human being, worshipping someone ‘who’s touched the divine’. I won’t totally discount a religious experience during my time in India, but unfortunately I think I was born a natural cynic and a sceptic! But I think I’m open minded enough to just go with it for a few days and see what happens. 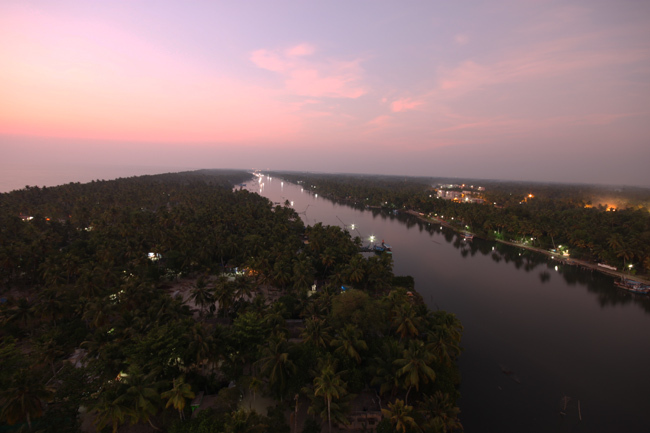 Leaving Kollam, we arrived at the ashram to spend a few days taking it all in. Putting scepticism aside, and hoping for an interaction with the Hugging Mother. When you arrive, you’ll see a huge pink high rise housing block reaching to the sky on the other side of the river. Not quite the wooden shacks I was excepting, but then the ashram houses more than two thousand full time monks, nuns and students at any one time. Already I could see that we weren’t dressed for the occasion. White was the uniform of the devoted. White tops. White trousers. White shawls. White everything! During registration (register online before hand! ), I noticed the first peculiar thing the ashram had to offer. One of the first questions on the paperwork was “Have you had any history of mental illness?” Better clear that up early I suppose. Then the form requested my spiritual name. I looked over the shoulder of the guy in front of me and saw his spiritual name. It was: ‘The continuity of the flower’. “Here we go!” I thought! There’s a reasonably strict set of rules at the ashram. Clothes that cover ones modesty, all white preferably, no public affection (hugging included), no drug taking, no smoking anywhere in the complex, be inside the ashram by a certain time, absolutely no photography, don’t feed the crows, no talking to the locals…the usual stuff. Unable to spontaneously create a spiritual name, confirming my sanity with my signature, we were given a key to our room. 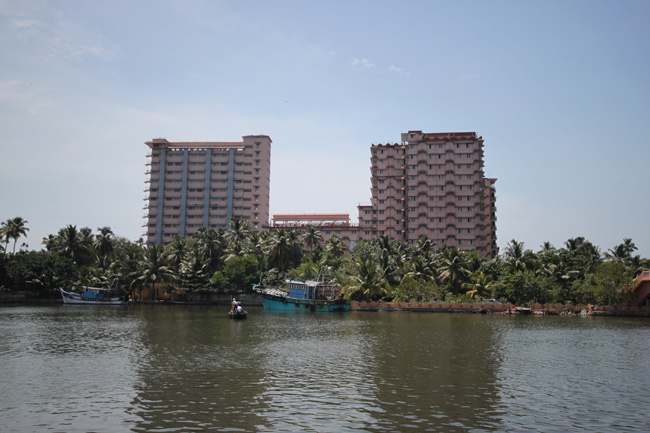 The 2nd tallest building in the Matha Amrithanandamayi Ashram complex on floor 16 of Block A, it has jaw dropping views over the Kerala Backwaters on one side and the Lakshadweep sea on the other. Our room was bare, but spotlessly clean. Zero furniture and plastic mattresses with provided sheets (no padded walls in case you were wondering). Visitors are responsible for cleaning the room themselves, so beware of the toilet. I had to clean ours! A tour of the ashram was organised for 5pm in the main temple room. All the new comers were sat down in front of a projector. Expecting instant brain-washing or hypnotising I was quite surprised when the video shown was actually informative and interesting. The Amma Foundation Charities are highly active in India and worldwide. Delivering disaster relief to those affected in the recent Japan disaster and Hurricane Katrina victims. As well as providing homes, education and donations to those who need it. The rest of the video was a background on Amma herself. How she’s dedicated her life to others, offering counselling and love in the form of hugs. Apparently issuing more than 30 million hugs in her life! She’s known to regularly pull off 24+ hour marathon hugging sessions. The guy doing the tour was an enthusiastic chap, who’d lived at the ashram for eighteen years. I couldn’t help but smile to myself when posters everywhere state strictly no mobile or camera devices, and he’s tapping away on his iPhone! Then came the tour of the complex. It’s massive! We were shown the Bhajan hall area where Darshan (an audience) is given by Amma. The hall is a huge open space, with blaring music and screens with projections of Amma’s face. A large banner stating “CHANT YOUR MANTRA” was hung up nearby to remind those who were silly enough to have forgotten. The next day we collected our tokens for Darshan that day, our hug tickets for Amma. Not sure what the procedure was, we headed over to the main temple complex to receive our orders and find out how it all works. It’s all very regimented, x-ray scanners on the way into the temple, shoes off, no bags. We sat in line on some plastic chairs while patiently waiting for the queue to slowly shuffle along. The hall was quite busy, mainly filled with western devotees facing the crowd on stage. A mass of bodies were huddled around on stage, with people trying to peer over and around each other, presumably to get a look at Amma. Piecing music was blaring from large overhead speakers as musicians played various instruments. Looking around, the majority of people had their eyes closed, some mumbling, a few moving their heads and bodies rhythmically to the music. I had to keep tapping the young girl next to me to wake her up as the queue pushed on towards our religious embrace. Inspecting those sat around me, a few had vacant, benign smiles. Some just stared into space, but most sat with their eyes closed. Palms upturned in a meditative position, some pinching their thumb and index finger together. Suddenly I noticed a western woman at the front with the longest dreadlocks I’ve ever seen start to uncontrollably rotate her head. It was like she had some invisible ear-phones listening to the heaviest of heavy metal. I was about to shout out and call for help but it became clear that she appeared to be in a trance-like state. Obviously the occasion had got too much. Biting my lip and suppressing a smirk, I nudged the girl awake again and we musical-chaired our way closer still to the side door next to the stage. 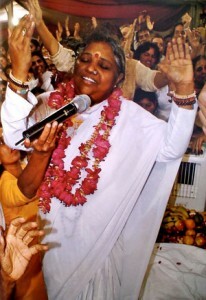 Edging ever closer to Amma. Now sat in the side room next to the stage, I caught my first sight of the hugging mother. She was sat in a throne surrounded by aides, both Indian and western. I can confirm she looked exactly like she does on the thousands of posters and stickers all over the complex, and the t-shirts and life-like dolls available to buy in the ashram’s shops. The overhead fans had stopped working and the heat was rising in the room, increasing the intensity of this religious experience. The musical chairs continued, hopping one chair at a time towards Amma. I noticed a lot of people weren’t queuing up for their hug, but just sat on the stage watching Amma longingly, some trance-like, but again mostly with their eyes closed. We were almost there. I was 2 seats away from being ushered up to the stage. I was shown a laminated card with more rules on it. ‘No weight to be placed on the Mother. No hands must touch the mother. Hands to be placed on the chair arms next to the Mother’. Not wanting to cause a scene, or offer Eloise a chance to start laughing, I solemnly did what I was told and started to wipe my face with my hands. Acutely aware that this woman hadn’t spoken to anyone else but me, I was becoming more self conscious that my bright red Beer Lao t-shirt and shorts might not be appropriate attire for the occasion. My hand face wiping didn’t seem to satisfy the queue officer, and she passed me a rather ancient looking brown handkerchief for me to touch to my brow. Another hurdled conquered, I was finally summoned to the stage. I was asked my nationality and told to remove my glasses. Just 2 hugs to go then I would be up there. 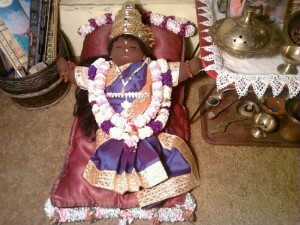 The devotees in front of me were told to kneel down in front of the throne as they were edged forward. Now my turn. I knelt down, shuffled forward, and awaited my destiny. I was nudged forward by one of her aides. I didn’t really get much face-to-face time with Amma, as I was too busy concentrating on placing my hands correctly and not leaning 15 stone onto her thighs. (She looked blurry anyway without my glasses.) 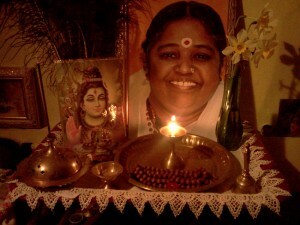 In unison my head was pushed from behind, and Amma reached and pulled my head down to her chest. Slowly rocking, she was repeatedly saying what sounded like, “Mee Darling, Mee Darling, Mee Darling”. The hug lasted around 10 seconds, which is quite long if you think about it. She smelled heavily of a smoky insense, and thankfully nothing too intoxicating. Then in one smooth move, two people lifted me up by my armpits. A sweet (candy) was shoved into my hand from somewhere and I was guided off the stage back into the main area. Sucking my sweet waiting for Eloise, I analysed my inner self. Did I feel any different? Had I experienced a spiritual moment? Was I enlightened? Then I saw the meditating girl who was sat next to me had been given a banana rather than a sweet. “I would have preferred a banana!” I thought. Check out: Staying at the Hugging Mother Ashram #2 – Life at the Ashram. The food. The devotees. The craziness for more Hugging Mother antics! It's Wedding Season in India! I found the read very enjoyable. The account is very funny and I wish I had as much you taste for adventure and new experiences 😉 Cheers. Hi Mantish! Glad you liked it! We definitely had a funny experience. The hard part was making the decision to do it! 🙂 Thanks for the comment! Wow, the view from above is just so beautiful! And you seem to be having so much fun with that experience!